Everything is covered with dust and many people wear masks. 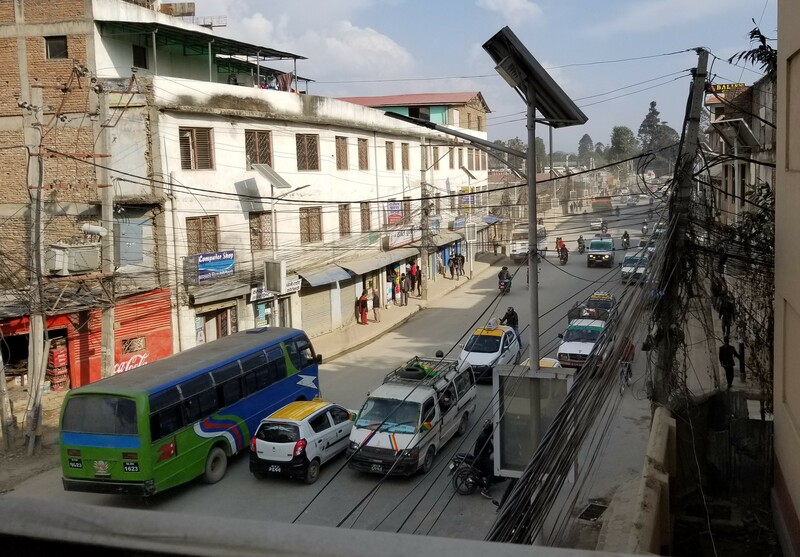 If you are interested, here’s an article expanding on traffic and air quality in Kathmandu. Another piece of context is that there was a devastating earthquake in 2015 from which Kathmandu and Nepal haven’t recovered. Today we set off fresh and brave after a decent night’s sleep. For the first crossing, we tailgated some little old ladies who knew how to do it. Subsequent crossings were harrowing. Usually we watched for people who looked like they valued their lives, and we stayed close. I don’t have any good photos or videos that illustrate the situation – I decided better alive than attempting to go live. 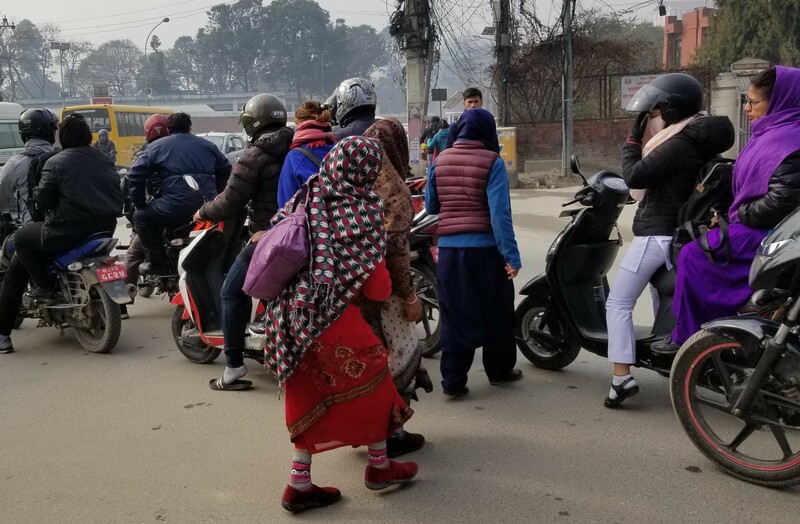 In a day walking around central Kathmandu, we saw no stop signs, no traffic lights, one traffic policeman, thousands of cars, millions of motorcycles, and just two crosswalks – where nobody (seriously, nobody) even slowed down. Not too much noise, though, since horns were banned in 2017. (I wouldn’t say the ban was entirely succesful, but it had some influence.) 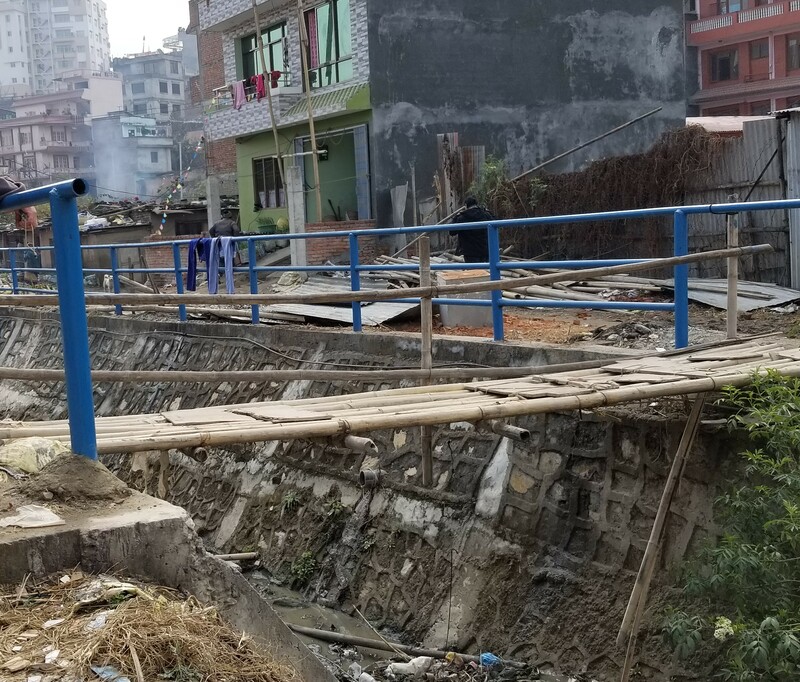 The walking surface/sidewalk is irregular and pot-holed, so let’s just say that Kathmandu is not a pedestrian-friendly city. Our destination was Swayambhunath (the Monkey Temple) with a return through Thamel. I prepared by getting a Google walking route set up but soon abandoned that. While we contemplated this pedestrian bridge, a man came along, ducked under the barrier, and skipped across. The Monkey Temple involved going up a lot of stairs. What you can’t appreciate from the photos is how continuous the traffic is, even when it looks sparse. Since there are no traffic-stopping mechanisms, it just keeps coming. Except for crossing the streets, we felt perfectly safe, the people are friendly and there was lots to look at.